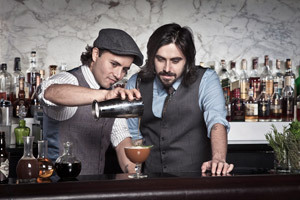 Here is a delicious organic cocktail from the mad mixology mind of Bar Lab co-founder Gabriel Orta. Nature’s Agave pairs beautifully with earthy tones of mezcal, so get creative and you can pull this one off to the delight of your guests. You will need to infuse the Nature’s Agave “Clear” with lavender - it’s actually pretty easy. Just add lavender to the agave and let it sit for 4 hours or so and voila, you’ve created your own lavender agave simple syrup. You will also notice eggwhites in the recipe. This is a traditional ingredient in classic cocktails and adds a wonderful texture and froth to the drink. Gabriel says its optional if you’re worried, but with the acidic lemon juice and mezcal, you will be fine. Add all ingredients into a shaker of ice. Shake vigorously and strain over a martini glass.